Above are two charts from yesterday’s UCLA Anderson Forecast. [Click on them to enlarge and get a clearer image.] There is a much overused phrase nowadays: the “new normal.” But when you combine those two charts with the chart below (slightly modified) from the recent Legislative Analyst’s report on the state budget outlook, the phrase takes on special meaning for UC. As can be seen on the Forecast charts, California’s economic base was hard hit around 1990 by the end of the Cold War. Its population stopped growing relative to the nation as a whole. And it lost jobs as a share of the nation’s total employment that have not been recovered. [Both developments can be seen on the top left-hand chart.] The upper-right hand chart shows that the state’s payroll employment trend that existed before the end of the Cold War was never resumed despite the dot-com boom of the 1990s and the housing boom of the 2000s. The Legislative Analyst used to say that California had a chronic “structural” state budget deficit, meaning that ongoing spending tended to outrun revenues over the long run. Now, thanks to Prop 30 (which eventually expires) and sluggish growth – which is sufficient nonetheless to pick up on the state revenue side when Prop 30 turns off – the state will tend to run surpluses (receipts > spending). 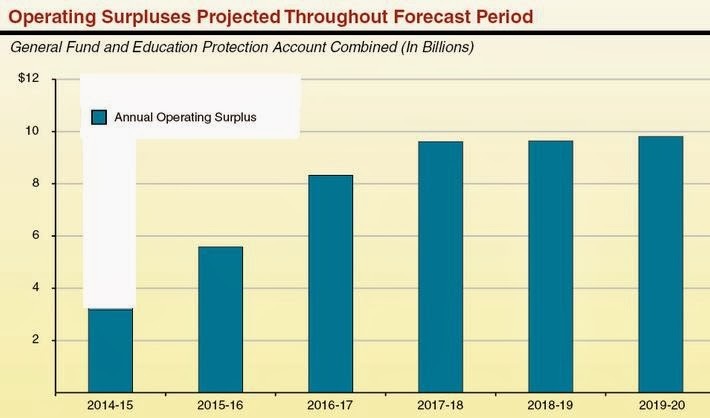 The surpluses projected also result in part from diminished spending plans that no longer outrun forecast revenues. However, as the governor and the legislative leaders have indicated, there will be only limited benefits from the shift away from a structural deficit for UC. The Leg Analyst doesn’t acknowledge that UC’s unfunded pension liabilities are the ultimate responsibility of the state, unlike those of CSU. UC tuition is not supposed to rise as part of what can be considered a one-sided deal. Other state programs which were cut during the Great Recession and its aftermath – notably K-14 funding under Prop 98 – will absorb the slack. Note that the Leg Analyst’s projection assumes no recession or economic setback through 2020. The UCLA Anderson Forecast goes only through calendar 2015; no one can really forecast the business cycle out to 2020. All that can be done in that longer horizon is to assume trend growth. Under Prop 30, the volatility of state funding – due to heavy reliance on income tax revenues – was increased, making the state more vulnerable to any setback that might occur. The intent of the governor is to build up a rainy day fund to deal with such vulnerability. How much cooperation he gets from the legislature remains to be seen, but significantly more funding than the governor wants for UC seems unlikely. In short, for UC, the end of the Cold War is not over. Next Next post: Core Competencies for Regents?